The Creation of the Heavens and the Earth. In contrast to the Old Testament, the Qur'an does not provide a unified description of the Creation. Instead of a continuous narration, there are passages scattered all over the Book which deal with certain aspects of the Creation and provide information on the successive events marking its development with varying degrees of detail. To gain a clear idea of how these events are presented, the fragments scattered throughout a large number of suras have to be brought together. This dispersal throughout the Book of references to the same subject is not unique to the theme of the Creation. Many important subjects are treated in the same manner in the Qur'an: earthly or celestial phenomena, or problems concerning man that are of interest to scientists. For each of these themes, the same effort has been made here to bring all the verses together. For many European commentators, the description of the Creation in the Qur'an is very similar to the one in the Bible and they are quite content to present the two descriptions side by side. I believe this concept is mistaken because there are very obvious differences. On subjects that are by no means unimportant from a scientific point of view, we find statements in the Qur'an whose equivalents we search for in vain in the Bible. The latter contains descriptions that have no equivalent in the Qur'an. The obvious resemblances between the two texts are well known; among them is the fact that, at first glance, the number given to the successive stages of the Creation is identical: the six days in the Bible correspond to the six days in the Qur'an. In fact however, the problem is more complex than this and it is worth pausing to examine it. There is absolutely no ambiguity whatsoever in the Biblical [ The Biblical description mentioned here is taken from the so-called Sacerdotal version discussed in the first part of this work; the description taken from the so-called Yahvist version has been compressed into the space of a few lines in today s version of the Bible and is too insubstantial to be considered here.] description of the Creation in six days followed by a day of rest, the sabbath, analogous with the days of the week. It has been shown how this mode of narration practiced by the priests of the Sixth century B.C. served the purpose of encouraging the people to observe the sabbath. All Jews were expected to rest [ 'Sabbath' in Hebrew means 'to rest'.] on the sabbath as the Lord had done after he had laboured during the six days of the week. The way the Bible interprets it, the word 'day' means the interval of time between two successive sunrises or sunsets for an inhabitant of the Earth. When defined in this way, the day is conditioned by the rotation of the Earth on its own axis. It is obvious that logically-speaking there can be no question of 'days' as defined just now, if the mechanism that causes them to appear-i.e. the existence of the Earth and its rotation around the Sun-has not already been fixed in the early stages of the Creation according to the Biblical description. This impossibility has already been emphasized in the first part of the present book. "Your Lord is God Who created the heavens and the earth in six days." There are very few translations and commentaries of the Qur'an that note how the word 'days' should really be taken to mean 'periods'. It has moreover been maintained that if the Qur'anic texts on the Creation divided its stages into 'days', it was with the deliberate intention of taking up beliefs held by all the Jews and Christians at the dawn of Islam and of avoiding a head-on confrontation with such a widely-held belief. ". . . in a period of time (yaum) whereof the measure is a thousand years of your reckoning." (It is to be noted that the Creation in six periods is precisely what the verse preceding verse 5 refers to). ". . . in a period of time (yaum) whereof the measure is 50,000 years." The fact that the word , yaum' could mean a period of time that was quite different from the period that we mean by the word 'day' struck very early commentators who, of course, did not have the knowledge we possess today concerning the length of the stages in the formation of the Universe. In the Sixteenth century A.D. for example, Abu al Su'ud, who could not have had any idea of the day as defined astronomically in terms of the Earth's rotation, thought that for the Creation a division must be considered that was not into days as we usually understand the word, but into 'events' (in Arabic nauba). Modern commentators have gone back to this interpretation. Yusuf Ali (1934), in his commentary on each of the verses that deals with the stages in the Creation, insists on the importance of taking the word, elsewhere interpreted as meaning 'days', to mean in reality 'very long Periods, or Ages, or Aeons'. It is therefore possible to say that in the case of the Creation of the world, the Qur'an allows for long periods of time numbering six. It is obvious that modern science has not permitted man to establish the fact that the complicated stages in the process leading to the formation of the Universe numbered six, but it has clearly shown that long periods of time were involved compared to which 'days' as we conceive them would be ridiculous. "Say. Do you disbelieve Him Who created the earth in two periods? Do you ascribe equals to Him. He is the Lord of the Worlds. "He set in the (earth) mountains standing firm. He blessed it. He measured therein its sustenance in four periods, in due proportion, in accordance with the needs of those who ask for (sustenance? or information?). "Moreover (tumma) He turned to heaven when it was smoke and said to it and to the earth: come willingly or unwillingly! They said: we come in willing obedience. "Then He ordained them seven heavens in two periods, and He assigned to each heaven its mandate by Revelation. And We adorned the lower heaven with luminaries and provided it a guard. Such is the decree of the All Mighty, the Full of Knowledge." These four verses of sura 41 contain several points to which we shall return. the initially gaseous state of celestial matter and the highly symbolic definition of the number of heavens as seven. We shall see the meaning behind this figure. Also of a symbolic nature is the dialogue between God on the one hand and the primordial sky and earth on the other. here however it is only to express the submission of the Heavens and Earth, once they were formed, to divine orders. Critics have seen in this passage a contradiction with the statement of the six periods of the Creation. By adding the two periods of the formation of the Earth to the four periods of the spreading of its sustenance to the inhabitants, plus the two periods of the formation of the Heavens, we arrive at eight periods. This would then be in contradiction with the six periods mentioned above. In fact however, this text, which leads man to reflect on divine Omnipotence, beginning with the Earth and ending with the Heavens, provides two sections that are expressed by the Arabic word tumma', translated by 'moreover', but which also means 'furthermore' or 'then'. The sense of a 'sequence' may therefore be implied referring to a sequence of events or a series of man's reflections on the events mentioned here. It may equally be a simple reference to events juxtaposed without any intention of bringing in the notion of the one following the other. However this may be, the periods of the Creation of the Heavens may just as easily coincide with the two periods of the Earth's creation. A little later we shall examine how the basic process of the formation of the Universe is presented in the Qur'an and we shall see how it can be jointly applied to the Heavens and the Earth in keeping with modern ideas. We shall then realize how perfectly reasonable this way is of conceiving the simultaneous nature of the events here described. There does not appear to be any contradiction between the passage quoted here and the concept of the formation of the world in six stages that is to be found in other texts in the Qur'an. In the two passages from the Qur'an quoted above, reference was made in one of the verses to the Creation of the Heavens and the Earth (sura 7, verse 54) , and elsewhere to the Creation of the Earth and the Heavens (sura 41, verses 9 to 12). The Qur'an does not therefore appear to lay down a sequence for the Creation of the Heavens and the Earth. The number of verses in which the Earth is mentioned first is quite small, e.g. sura 2, verse 29 and sura 20, verse 4, where a reference is made to "Him Who created the earth and the high heavens". The number of verses where the Heavens are mentioned before the Earth is, on the other hand, much larger: (sura 7, verse 54; sura 10, verse 3; sura 11, verse 7; sura 25, verse 59; sura 32, verse 4; sura 50, verse 38; sura 57, verse 4; sura 79, verses 27 to 33; sura 91, verses 5 to 10). In actual fact, apart from sura 79, there is not a single passage in the Qur'an that lays down a definite sequence; a simple coordinating conjunction (wa) meaning 'and' links two terms, or the word tumma which, as has been seen in the above passage, can indicate either a simple juxtaposition or a sequence. "Are you the harder to create Or. is it the heaven that (God) built? He raised its canopy and fashioned it with harmony. He made dark the night and he brought out the forenoon. And after that (ba' da dalika) He spread it out. Therefrom he drew out its water and its pasture. And the mountains He has fixed firmly. Goods for you and your cattle." This list of earthly gifts from God to man, which is expressed In a language suited to farmers or nomads on the Arabian Peninsula, is preceded by an invitation to reflect on the creation of the heavens. The reference to the stage when God spreads out the earth and renders it arable is very precisely situated in time after the alternating of night and day has been achieved. Two groups are therefore referred to here, one of celestial phenomena, and the other of earthly phenomena articulated in time. The reference made here implies that the earth must necessarily have existed before being spread out and that it consequently existed when God created the Heavens. The idea of a concomitance therefore arises from the heavenly and earthly evolutions with the interlocking of the two phenomena. Hence, one must not look for any special significance in the reference in the Qur'anic text to the Creation of the Earth before the Heavens or the Heavens before the Earth: the position of the words does not influence the order in which the Creation took place, unless however it is specifically stated. The Qur'an presents in two verses a brief synthesis of the phenomena that constituted the basic process of the formation of the Universe. "Do not the Unbelievers see that the heavens and the earth were joined together, then We clove them asunder and We got every living thing out of the water. Will they not then believe?" "Moreover (God) turned to the Heaven when it was smoke and said to it and to the earth . . ."
There then follow the orders to submit, referred to on page 136.
b) The reference to a separation process (fatq) of an primary single mass whose elements were initially fused together (ratq). It must be noted that in Arabic 'fatq' is the action of breaking, diffusing, separating, and that 'ratq' is the action of fusing or binding together elements to make a homogenous whole. This concept of the separation of a whole into several parts is noted in other passages of the Book with reference to multiple worlds. The first verse of the first sura in the Qur'an proclaims, after the opening invocation, the following: "In the name of God, the Beneficent, the Merciful", "Praise be to God, Lord of the Worlds." The terms 'worlds' reappears dozens of times in the Qur'an. The Heavens are referred to as multiple as well, not only on account of their plural form, but also because of their symbolic numerical quantity. 7. "(God) is the One Who created for you all that is on the earth. Moreover He turned to the heaven and fashioned seven heavens with harmony. He is Full of Knowledge of all things." "And We have created above you seven paths. We have never been unmindful of the Creation." "(God) is the One Who created seven heavens one above an other. Thou canst see no fault in the creation of the Beneficent. Turn the vision again! Canst thou see any rift?" "Did you see how God created seven heavens one above another and made the moon a light therein and made the sun a lamp? [ It is to be noted that while the Bible calls both Sun and Moon 'lights', here, as always in the Qur'an, they are differently named; the first is called 'Light' (nur) and the second is compared in this verse to a 'lamp (siraj) producing light'. We shall see later how other epithets are applied to the Sun.]" "We have built above you seven strong (heavens) and placed a blazing lamp." Here the blazing lamp is the Sun. There are therefore many Heavens and Earths, and it comes as no small surprise to the reader of the Qur'an to find that earths such as our own may be found in the Universe, a fact that has not yet been verified by man in our time. "God is the One Who created seven heavens and of the earth (ard) a similar number. The Command descends among them so that you know that God has power over all things and comprehends all things in His knowledge." Since 7 indicates an indefinite plurality (as we have seen), it is possible to conclude that the Qur'anic text clearly indicates the existence of more than one single Earth, our own Earth (ard); there are others like it in the Universe. Another observation which may surprise the Twentieth century reader of the Qur'an is the fact that verses refer to three groups of things created, i.e. "To Him (God) belongs what is in the heavens, on earth, between them and beneath the soil." ". . . the One Who created the heavens, the earth and what is between them in six periods." "God is the One Who created the heavens, the earth and what is between them in six periods." The reference in the Qur'an to 'what is between the Heavens and the Earth' is again to be found in the following verses: sura 21, verse 16; sura 44, verses 7 and 38 ; sura 78, verse 37; sura 15, verse 85; sura 46, verse 3; sura 43, Verse 85. This Creation outside the Heavens and outside the Earth, mentioned several times, is a priori difficult to imagine. To understand these verses, reference must be made to the most recent human observations on the existence of cosmic extra-galactic material and one must indeed go back to ideas established by contemporary science on the formation of the Universe, starting with the simplest and proceeding to the most complex. These are the subject of the following paragraph. Existence of six periods for the Creation in general. Interlocking of stages in the Creation of the Heavens and the Earth. Creation of the Universe out of an initially unique mass forming a block that subsequently split up. Plurality of the Heavens and of the Earths. Existence of an intermediary creation 'between the Heavens and the Earth'. The Earth and planets rotating around the Sun constitute an organized world of dimensions which, to our human scale, appear quite colossal. The Earth is, after all, roughly 93 million miles from the Sun. This is a very great distance for a human being, but it is very small in comparison to the distance separating the Sun from the furthermost planet from it in the solar system (Pluto); in round numbers it is 40 times the distance from the Earth to the Sun, i.e. approximately 3,672 million miles away. This distance, when doubled, represents the largest dimension of our solar system. The Sun's light takes nearly 6 hours to reach Pluto, and yet the journey is made at the terrifying speed of over 186,000 miles per second. The light coming from stars on the very confines of the known celestial world therefore takes billions of years to reach us. The Sun, of which we are a satellite like the other planets surrounding it, is itself an infinitesmally small element among a hundred billion stars that form a whole, called a galaxy. On a fine summer night, the whole of space seems to be filled with stars that make up what is known as the Milky Way. This group has extremely large dimensions. Whereas light could cross the solar system in units of one hour, it would require something like 90,000 years to go from one extreme to the other of the most compact group of stars that make up our galaxy. The galaxy that we belong to however, even though it is so incredibly huge, is only a small part of the Heavens. There are giant agglomerates of stars similar to the Milky Way that lie outside our galaxy. They were discovered a little over fifty years ago, when astronomy was able to make use of an optical instrument as sophisticated as the one that made possible the construction of the Mount Wilson telescope in the United States. Thus a very large number indeed of isolated galaxies and masses of galaxies have been discovered that are so far away that it was necessary to institute a special unit of light-years, the 'parsec' (the distance light travels in 3.26 years at 186,000 miles per second). What was there originally in the immensely large space the galaxies now occupy? Modern science can only answer this question as of a certain period in the evolution of the Universe; it cannot put into numbers the length of time that separates this period from us. At the earliest time it can provide us with, modern science has every reason to maintain that the Universe was formed of a gaseous mass principally composed of hydrogen and a certain amount of helium that was slowly rotating. This nebula subsequently split up into multiple fragments with very large dimensions and masses, so large indeed, that specialists in astrophysics are able to estimate their mass from 1 to 100 billion times the present mass of the Sun (the latter represents a mass that is over 300,000 times that of the Earth). These figures give an idea of the large size of the fragments of primary gaseous mass that were to give birth to the galaxies. A new fragmentation was to form the stars. There then followed the intervention of a condensing process where gravitational forces came into play, (since these bodies were moving and rotating more and more quickly), along with pressures and the influence of magnetic fields and of radiations. The stars became shiny as they contracted and transformed the gravitational forces into thermal energy. Thermonuclear reactions came into play, and heavier atoms were formed by fusion at the expense of others that were lighter; this is how the transition was made from hydrogen to helium, then to carbon and oxygen, ending with metals and metalloids. Thus the stars have a life of their own and modern astronomy classifies them according to their present stage of evolution. The stars also have a death; in the final stage of their evolution, the violent implosion of certain stars has been observed so that they become veritable 'corpses'. The planets, and in particular the Earth, originated in a separation process starting from an initial constituent that in the beginning was the primary nebula. A fact that has no longer been contested for over twenty-five years is that the Sun condensed inside the single nebula and that the planets did the same inside the surrounding nebular. disc. One must stress-and this is of prime importance for. the subject in hand-that there was no sequence in the formation of the celestial elements such as the Sun nor in the formation of an earthly. element. There is an evolutionary parallelism with the identity of origin. Here, science can give us information on the period during which the events just mentioned took place. Having estimated the age of our galaxy at roughly ten billion years, according to this hypothesis, the formation of the solar. system took place a little over five billion years later'. The study of natural radio activity makes it possible to place the age of the Earth and the time the Sun was formed at 4.5 billion years ago, to within a present-day accuracy of 100 million years, according to some scientists' calculations. This accuracy is to be admired, since 100 million years may represent a long time to us but the ratio 'maximum error/total time-to-be-measured' is 0.1/4.5, i.e. 2.2%. Specialists in astrophysics have therefore attained a high degree of knowledge concerning the general process involved in the formation of the solar system. It may be summarized as follows: condensation and contraction of a rotating gaseous mass, splitting up into fragments that leave the Sun. and planets in their places, among them the Earth. [ As regards the Moon, its gradual separation from the Earth following the deceleration of its rotation is an acknowledged probability.] The knowledge that science has gained on the primary nebula and the way it split up into an incommensurable quantity of stars grouped into galaxies leaves absolutely no doubt as to the legitimacy of a concept of the plurality of worlds. It does not however provide any kind of certainty concerning the existence in the Universe of anything that might, either closely or vaguely, resemble the Earth. It is thought that in our galaxy half of the 100 billion stars must, like the Sun, have a planetary system. The fifty billion stars do indeed, like the Sun, rotate very slowly. a characteristic which suggests that they are surrounded by planets that are their satellites. These stars are so far away that the possible planets are unobservable, but their existence is thought to be highly probable on account of certain trajectory characteristics ; a slight undulation of the star's trajectory indicates the presence of a companion planetary satellite. Thus the Barnard Star probably has at least one planetary companion with a mass greater than that of Jupiter and may even have two satellites. As P. Guérin writes: "All the evidence points to the fact that planetary systems are scattered in profusion all over the universe. The solar system and the Earth are not unique." And as a corollary. "Life, like the planets that harbour it, is scattered throughout the universe, in those places where the physico-chemical conditions necessary for its flowering and development are to be found." The basic process in the formation of the Universe therefore lay in the condensation of material in the primary nebula followed by its division into fragments that originally constituted galactic masses. The latter in their turn split up into stars that provided the sub-product of the process, i.e. the planets. These successive separations left among the groups of principle elements what one might perhaps call 'remains'. Their more scientific name is 'interstellar galactic material'. It has been described in various ways; there are bright nebulae that reflect the light received from other stars and are perhaps composed of 'dusts' or 'smokes', to use the terminology of experts in astrophysics, and then there are the dark nebulae that are less dense, consisting of interstellar material that is even more modest, known for its tendency to interfere with photometric measurements in astronomy. There can be no doubt about the existence of 'bridges' of material between the galaxies themselves. Although these gases may be very rarefied, the fact that they occupy such a colossal space, in view of the great distance separating the galaxies, could make them correspond to a mass possibly greater than the total mass of the galaxies in spite of the low density of the former. A. Boichot considers the presence of these intergalactic masses to be of prime importance which could "considerably alter ideas on the evolution of the Universe." We must now go back to the basic ideas on the Creation of the Universe that were taken from the Qur'an and look at them in the light of modern scientific data. We shall examine the five main points on which the Qur'an gives information about the Creation. The six periods of the Creation of the Heavens and the Earth covered, according to the Qur'an, the formation of the celestial bodies and the Earth, and the development of the latter until (with its 'sustenance') it became inhabitable by man. In the case of the Earth, the events described in the Qur'an happened over four periods. One could perhaps see in them the four geological periods described by modern science, with man's appearance, as we already know, taking place in the quaternary era. This is purely a hypothesis since nobody has an answer to this question. It must be noted however, that the formation of the heavenly bodies and the Earth, as explained in verses 9 to 12, sura 41 (see page 136) required two phases. If we take the Sun and its subproduct the Earth as an example (the only one accessible to us), science informs us that their formation occurred by a process of condensation of the primary nebula and then their separation. This is exactly what the Qur'an expresses very clearly when it refers to the processes that produced a fusion and subsequent separation starting from a celestial 'smoke'. 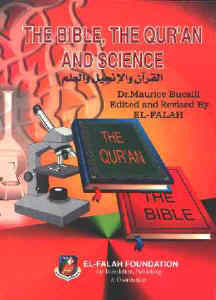 Hence there is complete correspondence between the facts of the Qur'an and the facts of science. Science showed the interlocking of the two stages in the formation of a star (like the Sun) and its satellite (like the Earth). This interconnection is surely very evident in the text of the Qur'an examined. The existence at an early stage of the Universe of the 'smoke' referred to in the Qur'an, meaning the predominantly gaseous state of the material that composes it, obviously corresponds to the concept of the primary nebula put forward by modern science. The plurality of the heavens, expressed in the Qur'an by the number 7, whose meaning we have discussed, is confirmed by modern science due to the observations experts in astrophysics have made on galactic systems and their very large number. On the other hand the plurality of earths that are similar to ours (from certain points of view at least) is an idea that arises in the text of the Qur'an but has not yet been demonstrated to be true by science; all the same, specialists consider this to be quite feasible. The existence of an intermediate creation between 'the Heavens' and 'the Earth' expressed in the Qur'an may be compared to the discovery of those bridges of material present outside organized astronomic systems. Although not all the questions raised by the descriptions in the Qur'an have been completely confirmed by scientific data, there is in any case absolutely no opposition between the data in the Qur'an on the Creation and modern knowledge on the formation of the Universe. This fact is worth stressing for the Qur'anic Revelation, whereas it is very obvious indeed that the present-day text of the Old Testament provides data on the same events that are unacceptable from a scientific point of view. It is hardly surprising, since the description of the Creation in the Sacerdotal version of the Bible [ This text completely overshadows the few lines contained in the Yahvist version. The latter is too brief and too vague for the scientist to take account of it.] was written by priests at the time of the deportation to Babylon who had the legalist intentions already described and therefore compiled a description that fitted their theological views. The existence of such an enormous difference between the Biblical description and the data in the Qur'an concerning the Creation is worth underlining once again on account of the totally gratuitous accusations leveled against Muhammad since the beginnings of Islam to the effect that he copied the Biblical descriptions. As far as the Creation is concerned, this accusation is totally unfounded. How could a man living fourteen hundred years ago have made corrections to the existing description to such an extent that he eliminated scientifically inaccurate material and, on his own initiative, made statements that science has been able to verify only in the present day? This hypothesis is completely untenable. The description of the Creation given in the Qur'an is quite different from the one in the Bible. Indisputably, resemblances do exist between narrations dealing with other subjects, particularly religious history, in the Bible and in the Qur'an. It is moreover interesting to note from this point of view how nobody holds against Jesus the fact that he takes up the same sort of facts and Biblical teachings. This does not, of course, stop people in the West from accusing Muhammad of referring to such facts in his teaching with the suggestion that he is an imposter because he presents them as a Revelation. As for the proof that Muhammad reproduced in the Qur'an what he had been told or dictated by the rabbis, it has no more substance than the statement that a Christian monk gave him a sound religious education. One would do well to re-read what R. Blachère in his book, The Problem of Muhammad (Le Problème de Mahomet) [ Pub. Presses Universitaries de France, Paris, 1952. ], has to say about this 'fable'. A hint of a resemblance is also advanced between other statements in the Qur'an and beliefs that go back a very long way, probably much further in time than the Bible. More generally speaking, the traces of certain cosmogonic myths have been sought in the Holy Scriptures; for example the belief held by the Polynesians in the existence of primeval waters that were covered in darkness until they separated when light appeared; thus Heaven and Earth were formed. This myth is compared to the description of the Creation in the Bible, where there is undoubtedly a resemblance. It would however be superficial to then accuse the Bible of having copied this from the cosmogonic myth. It is just as superficial to see the Qur'anic concept of the division of the primeval material constituting the Universe at its initial stage-a concept held by modern science-as one that comes from various cosmogonic myths in one form or another that express something resembling it. It is worth analysing these mythical beliefs and descriptions more closely. Often an initial idea appears among them which is reasonable in itself, and is in some cases borne out by what we today know (or think we know) to be true, except that fantastic descriptions are attached to it in the myth. This is the case of the fairly widespread concept of the Heavens and the Earth originally being united then subsequently separated. When, as in Japan, the image of the egg plus an expression of chaos is attached to the above with the idea of a seed inside the egg (as for all. eggs), the imaginative addition makes the concept lose all semblance of seriousness. In other countries, the idea of a plant is associated with it; the plant grows and in so doing raises up the sky and separates the Heavens from the Earth. Here again, the imaginative quality of the added detail lends the myth its very distinctive character. Nevertheless a common characteristic remains, i.e. the notion of a single mass at the beginning of the evolutionary process leading to the formation of the Universe which then divided to form the various 'worlds. that we know today. The reason these cosmogonic myths are mentioned here is to underline the way they have been embroidered by man's imagination and to show the basic difference between them and the statements in the Qur'an on the same subject. The latter are free from any of the whimsical details accompanying such beliefs; on the contrary, they are distinguished by the sober quality of the words in which they are made and their agreement with scientific data. Such statements in the Qur'an concerning the Creation, which appeared nearly fourteen centuries ago, obviously do not lend themselves to a human explanation.